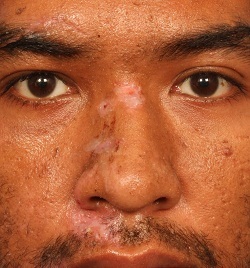 Figure 1: A crooked nose as a result of nasal fracture. Nasal fracture is the commonest fracture of the facial bones. Fracture can occur following low velocity injury like a fall or following a high velocity injury such as a road traffic accident. It may occur in isolation or may be associated with other fractures of the face such as the cheekbone. With nose fractures, generally there may be some bleeding from either or both nostrils. The bleeding generally stops by itself. The patient may notice that the nose is crooked, swollen or bruised. Breathing may be impaired as well as the fractures may have obstructed one or both of the nasal passages. Because of the injury and swelling, the degree or severity of the nasal deviation is generally difficult to appreciate in the acute/early stage. Generally it is recommended that the fractured bones be precisely repositioned by manipulation under general anesthesia. This procedure is known as M&R of the nose (Manipulation and Reduction of the nose). The nose is then packed and splinted externally by a splint to prevent the repositioned bone pieces from moving. 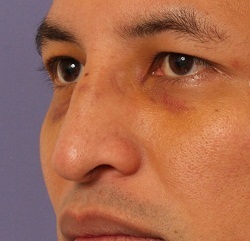 Figure 2: A saddle nose as a result of nasal fracture. The splints and packs are progressively taken out over 1 week and the patient needs to protect the nose from pressure and movements over the next 3 weeks. The patient needs to be followed up long term. With this approach however, a significant proportion of patients may have a residual crooked nose. A definitive open rhinoplasty for crooked nose may be performed from 4 – 6 months after the initial injury. The M&R approach remains a good option for patients with more minor fractures of the nose. However with this approach, many studies have shown that a significant number of patients will have residual nasal deformities requiring secondary correction. This is particularly so for patients with more severely injured nose. Dr Wong has been an advocate and pioneer of the Immediate open approach in the management of nasal fractures. His experience with this approach has been published in the prestigious peer review journal - Aesthetics Surgery Journal. With this approach, open rhinoplasty is performed immediately after nasal fractures (within 3 week of the injury). The benefits include the following: Precise reduction and reconstitution of the anatomy can be achieved. Having achieved the reduction, ‘internal fixation’ can be performed to reinforce stabalize the nose in the optimal position with cartilage grafts harvested either from the nose, ear or rib. This aspect of the procedure is purely functional to restore the nose to the pre-injury state. Taking this procedure to a higher level, in selected patients who desire their nose to be improved, an aesthetic/cosmetic improvement of the nose can be performed safely and reliably during the reconstructive rhinoplasty. This include for example giving a higher nose bridge, a sharper tip or a more projected tip. This not only restore the function of the nose (straightening the nose as well as ensuring it breaths well), the nose can be cosmetically enhanced safely during the same operation. With this approach, the need for a secondary revision rhinoplasty is much reduced and the importantly the results are much better than the M&R approach. This is a highly complex and delicate operation requiring the utmost care. Dr Wong takes great lengths to explain options, potential outcomes, risks and potential complications to his patients.